Be the first to share your favorite memory, photo or story of L. Franklin. This memorial page is dedicated for family, friends and future generations to celebrate the life of their loved one. L. Franklin “Frank” Wallace, 88, of Coatesville died Wednesday, November 28, 2018 at Lancaster General Hospital. Born in Coatesville, Frank was the son of the late Lloyd F. and Emily Liggett Wallace. He was the husband of 56 years of the late Jeanette Landis Wallace who died in 2010. Frank served in the US Army during the Korean War. He was a solid-state physicist with RCA / Burle Industries in Lancaster. Frank was a lifelong member of Olivet United Methodist Church in Coatesville. 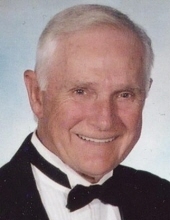 He was an avid golfer, fox hunter and loved following the news and weather. He loved all Philly sports. Frank is survived by 2 sons; Bradley of Boynton Beach, FL and Jeffrey (Rita) of Lebanon and a daughter Rebecca (Shane) Tucci of Coatesville. He is also survived by 3 grandsons; M. Joel Hess, Joshua F. Wallace and Nicholas E. Tucci. In addition to his parents and his wife, Frank is predeceased by a daughter Beth Ann Hess and a grandson Andrew Hess. Frank’s funeral service will be held on Thursday, December 6, 2018 at 11 am at Olivet United Methodist Church. Family and friends may call at the church beginning at 10 am. Interment will be in Fairview Cemetery, Coatesville. Memorials in Frank’s honor may be made to Olivet United Methodist Church, 310 E. Chestnut St., Coatesville, PA 19320 or the American Cancer Society, 1818 Market St, Philadelphia, PA 19103. To send flowers or a remembrance gift to the family of L. Franklin Wallace, please visit our Tribute Store. "Email Address" would like to share the life celebration of L. Franklin Wallace. Click on the "link" to go to share a favorite memory or leave a condolence message for the family.